On the eve of "Swarmageddon," the name given to a cicada awakening 17 years in the making, the United Nations has released a report that highly recommends eating insects as a part of a healthy and balanced diet. The U.N. Food and Agriculture Organization (FAO) states that many of the 1,900 species of insects that humans have been known to eat have the same amount of protein as meat and more healthy fats that are recommended in most healthy diets. While several cultures in Asia and Africa have embraced eating insects for centuries, the West is still a bit queasy when it comes to chowing down on creepy crawlies. The average American's exposure to insects as food is that bald dude from "Bizarre Foods" eating a teriyaki cockroaches and chances are, your roommate threw her remote at the TV and everyone gagged for five minutes. "In the West we have a cultural bias, and think that because insects come from developing countries, they cannot be good," said Arnold van Huis, one of the authors of the report. 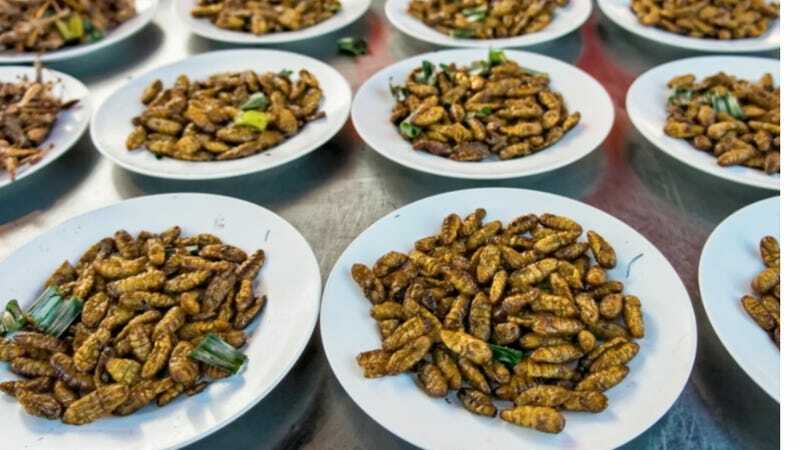 Although restaurants in Europe are beginning to offer more insect-based dishes,according to Eva Muller of the FAO, they are presented as exotic delicacies, not as a nice alternative to meat balls at your local IKEA. Speaking of meatballs, Van Huis conducted a blind study to test whether certain insects could appeal to Western tastebuds with meatballs made of half meat and half mealworms next to meatballs made of 100 percent meat. Van Huis reported nine our of 10 people preferred the mealworm meatballs. We've all got an inner Beetlejuice, it appears. With millions and maybe even billions of cicadas set to emerge from the ground and mate frantically this summer, why not take the U.N.'s advice (for ONCE) and nosh on some cicadas? If the idea of chewing on the crunchy exoskeleton of a half-inch bug 17 years in the making doesn't bother you, give Jenna Jadin's cicada cookbook "Cicada-licious" a try. With dishes like "El Chirper Tacos" and "Banana Cicada Bread," it doesn't sound all bad. I'll let you have the first bite, though. No, really, you can go first.